The Centre for World Christianity co-hosted a one-day conference on ‘Women in the World Church’ to explore the historical and contemporary role of women in global Christianity on 16 September 2017. 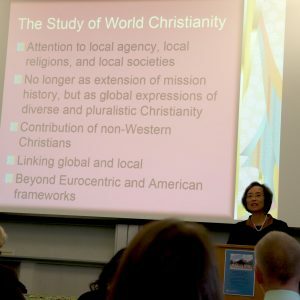 The title address came from guest scholar Professor Kwok Pui-Lan, an Asian feminist theologian, who focused her remarks on both the women who helped to build the growing Christian communities in the Global South and those of the women missionaries who served them. The study of the agency of local Christian women must take into consideration the wider social, historical, and political environment in which these women lived.